Second-generation Active Park Assist can handle virtually every aspect of parking. Ford Motor Co. introduced Active Park Assist on its 2009 Ford Escape crossover to give drivers help maneuvering into parking spaces. Its next-generation Ford Explorer and Lincoln Aviator crossovers, on sale this year, will debut a second generation of that technology featuring a more hands-off experience. Previously, the driver had to control the brakes, acceleration and shifting as the system helped maneuver the vehicle into a parallel or perpendicular parking spot. No longer. Now, using ultrasonic sensors and cameras around the vehicle, the technology can handle virtually every aspect of parking for drivers. All they need to do is press and hold a button in the center stack. The system will stop immediately if the driver lifts his or her finger off the button. 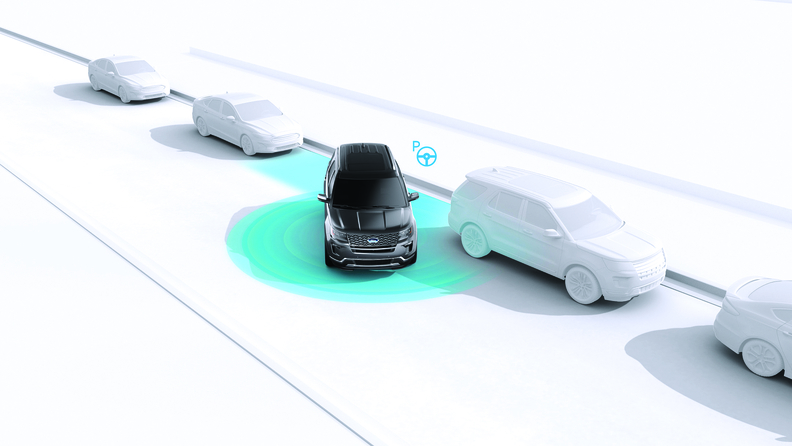 "We learned a lot from the original system and what customers liked about it and what they wanted to see improved," said Chris Billman, Ford's global driver assist technologies manager. "It is still one of the more complex driver assistance features we offer." The technology is standard on the Explorer's Platinum trim. Ford likely will expand the offering across its lineup as new models roll out. The Explorer and Aviator also will feature a reverse brake assist that can automatically apply brakes while the vehicle backs up at a low speed.